Our innovative and incredibly tasty collaboration six-pack hits shelves in mid-November, so we're showcasing the beers with a tour of our regional friends. Beer is best enjoyed with friends, so we invited Cloudwater Brew Company, Fourpure Brewing Company, Hardknott Brewery, Marble Beers Limited, Moor Beer Company and Thornbridge Brewery down to Fuller's for a very special collaboration. We let our imaginations run wild, drawing inspiration from the USA, New Zealand and our own rich traditions. The result is a family of bottle conditioned beers that are as diverse and delicious as anything you'll find in the world of brewing. So, to celebrate their launch, we're hosting beer lovers in a series of events in the cities our friends brew in. 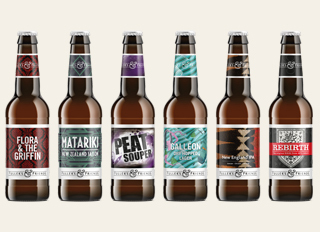 Taking its name from the notorious Hardknott Pass in Cumbria, Hardknott's beers take influences from around the world. The Peat Souper smoked porter we've brewed draws on the capital's history of smoky, rich porters and uses a trio of classic British hops. Marble have driven British beer culture forward since the late 1990s, having started life in the back of the Marble Arch pub. Our New Zealand Saison combines the Belgian style with antipodean ingredients for a complex but drinkable beer. Cloudwater has become one of the most talked about breweries in its three years - it was voted fifth-best brewery in the world in last year's Ratebeer awards. US and UK hops make a soft, juicy New England IPA, bottle conditioned old-England style. Since its founding in 2005, Thornbridge has had a huge impact on British brewing. Brewing in Bakewell, quality and flavour go hand-in-hand. A punchy red ale, Flora And The Griffin uses a diverse range of ingredients including spicy rye malt and American hops. Moor Beer brings together the best of British, American and German brewing traditions, and are based in Bristol after having been founded on the Somerset Levels. Our original, 1971 ESB recipe has been reborn, using hops form Britain, Australia, the USA and Slovenia. Fourpure is one of London's most dynamic new breweries, producing nimble and progressive brews inspired by New York, Munich and beyond. We've dry hopped our Galleon lager with lashings of Loral, to create a floral, citrus beer packed with punch. It was a privilege to welcome these six great brewers to Fuller's. Collaborating like this is hugely valuable because you end up with not only great beer, but great friends too. I can't wait to see what drinkers make of our beers. Fuller's is family-owned and proudly independent, and we've been brewing at the historic Griffin Brewery in Chiswick since 1845. World-famous for our stable of award-winning ales, we've played a key role in nurturing London's booming craft-beer culture. The launch of Fuller's & Friends shows our dedication to brewing brilliant new beers and supporting the best of Britain's independent breweries.